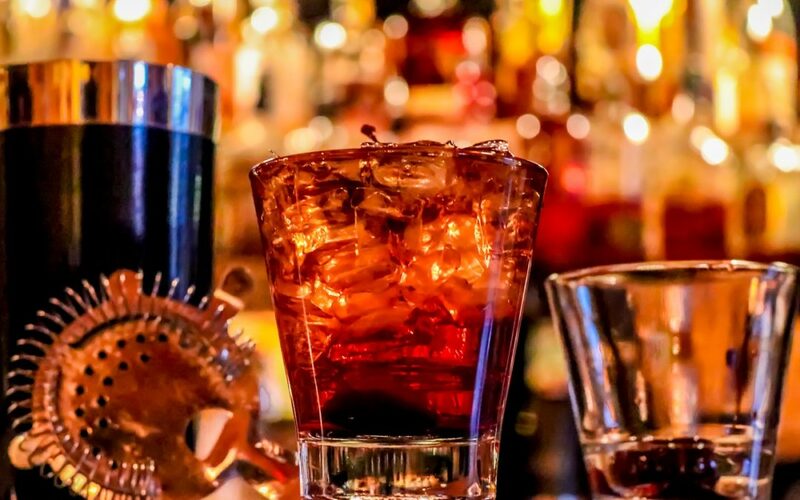 It is common knowledge that if your business is in the business of providing alcoholic beverages, then you must have a liquor license and purchase liquor liability insurance from your broker. This would be relevant to bars, restaurants, sports facilities and other businesses where liquor is “on the menu”. But what if your business doesn’t typically provide liquor and wants to host an event where liquor is served? Should you allow alcohol at the company picnic? For most businesses, there may be coverage. Let’s examine. 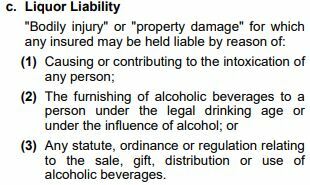 The exclusion says that bodily injury or property damage for which the insured (policyholder) is liable is excluded as it relates to liquor, especially if the business may be held liable for causing intoxication, furnishing alcohol to underage persons or someone who is already intoxicated, or violates any laws with regard to the sale, gift, or distribution of alcoholic beverages. This seems pretty clear. There is no coverage for liquor liability under the policy. But is it completely excluded? You may have heard this term before “host liquor liability”. Does it exist, or is it some mythical creature dreamed up by someone under the influence? This is where the concept of host liquor liability comes in. If you own a plumbing business, then you are not in the business of manufacturing, distributing, selling, serving or furnishing alcoholic beverages. 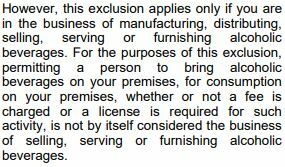 If someone comes to your premises with permission and a 6-pack, then the exclusion does not apply. Should your business be sued for bodily injury or property damage because of that 6-pack, your liability policy would likely cover you. An accounting firm holds a company picnic and provides alcoholic beverages to employees and their families during the picnic. Is this considered host liquor liability? The accounting firm holds a company picnic and sells alcoholic beverages to attendees to benefit a charity. Are they now in the business of selling liquor? A hair salon provides free wine to customers. Is this considered host liquor liability? 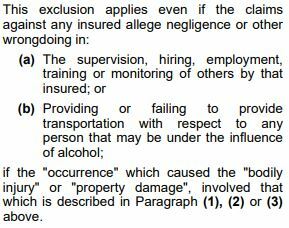 So much of how this exclusion works is dependent on a number of factors including the number of incidental alcohol events a business holds or hosts, and the exact wording of the exclusion as written in your particular policy. With so much about this up in the air, how do you protect your business? Place a call to your insurance broker. Talk about those times and events where alcohol may be at your company premises or off-premises at company events. Is it sold? How is the alcohol served, and by whom? How many times a year does this occur? There are endorsements available to cover your business for liquor liability in the case of gray areas. Call Hayes Brokers to find out more.